Tenjin is a smart test automation platform created to enable users to run tests on multiple integrated enterprise applications without having to deal with scripts. The software aims to simplify and accelerate the testing process and ensure fast deployment and reusability across versions and applications without impacting test execution timeframe. 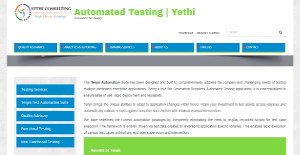 With Tenjin Test Automation, you can easily test your applications and make the necessary adjustments and changes. The software makes it possible for you to still retain your investments in tests assets and instantly justify results versus baseline data. And Tenjin Test Automation lets you do all of this with only little manual intervention. Tenjin Test Automation Suite is highly intuitive and very user-friendly. It does not require dedicated intervention from users and makes the whole enterprise application testing fast and streamlined. There is no need for users to record or create a Keyword-Driven Framework. The system automatically takes notes and learns field attributes, navigation and business processes of front-end UI screens. It also comes with the ability to spot, differentiate, and adjust to changes in the applications across releases. Tenjin lets you implement parallel multiple test cases automatically and these tests are totally fueled by test data. The platform comes with the ability to navigate and enter information into those fields with specific data. With Tenjin, users are able to address two focal points of pain when it comes to automation testing – maintenance and reuse, thanks mainly to its ability to spot and adjust immediately to modifications made in the application. Tenjin Test Automation Suite helps enterprise and organizations to greatly improve their leverage of current and future Test Assets, allowing for faster realization of tangible ROI on Test Automation investments. There is no effort needed for maintenance and it auto validates downstream results. Tenjin automatically adapts to application changes. In the end, it speeds up application testing without harming your investments on test assets, thereby saving you a lot of effort and money. What Problems Will Tenjin Solve? 1. As it auto-creates test data templates as well as auto-executes the test cases, requiring minimal manual intervention, the setup time and effort is reduced to a large extent. The deployment of a custom Tenjin adapter for a new application typically takes only 4-6 weeks. 2. Since it adapts itself to any changes in the application, the maintenance time and efforts are nearly eliminated. 3. Tenjin increases the speed of execution by a factor of 10x as compared to manual execution thus saving both effort and time. If you are interested in Tenjin it may also be sensible to examine other subcategories of Best Test Management Software gathered in our database of B2B software reviews. It's important to note that hardly any app in the Test Management Software category will be a perfect solution that can fulfill all the goals of all company types, sizes and industries. It may be a good idea to read a few Tenjin reviews first as some software might perform well just in a really small set of applications or be designed with a really specific industry in mind. Others can operate with an idea of being simple and intuitive and as a result lack complex functions welcomed by more experienced users. You can also find services that cater to a broad group of customers and give you a complex feature toolbox, but that in most cases comes at a higher price of such a solution. Ensure you're aware of your needs so that you get a solution that offers specifically the features you search for. How Much Does Tenjin Cost? We realize that when you make a decision to buy Test Management Software it’s important not only to see how experts evaluate it in their reviews, but also to find out if the real people and companies that buy it are actually satisfied with the product. That’s why we’ve created our behavior-based Customer Satisfaction Algorithm™ that gathers customer reviews, comments and Tenjin reviews across a wide range of social media sites. The data is then presented in an easy to digest form showing how many people had positive and negative experience with Tenjin. With that information at hand you should be equipped to make an informed buying decision that you won’t regret. What are Tenjin pricing details? What integrations are available for Tenjin?